Am I the only one that is obsessed with decorating their kitchen utensils? When I look at an appliance or utensil that is setting out on my countertop, I feel like I need to make it pretty. I already decorated my Kitchen Aid Mixer and my Crock Pot, so I figured why not make some fun cutting boards too? 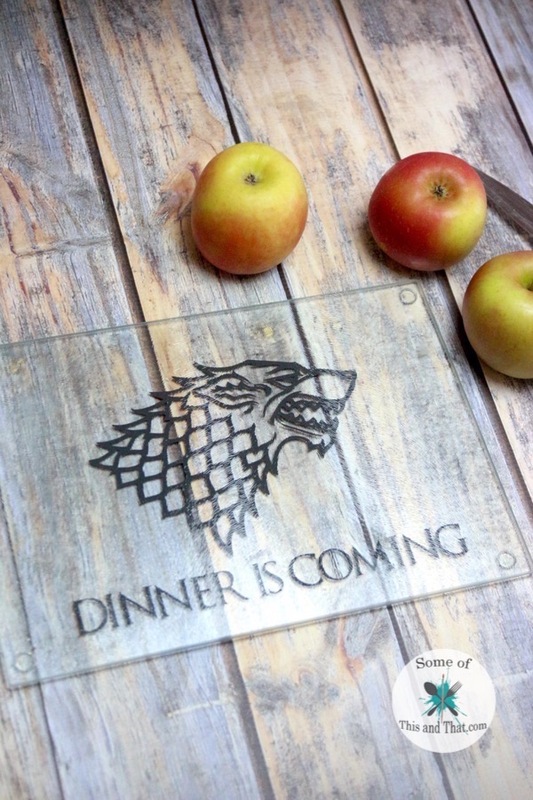 Today I am sharing how I made this super fun DIY Game of Thrones Cutting Board! I have made cutting boards in the past, and they have held up great! The secret is to use a vinyl that is rated for outdoor use. I have one that I made over a year ago and it still looks great. I do hand wash them, and only occasionally put them in the dishwasher (we all have those lazy days). Since the vinyl is on the underside of the cutting board, it still completely functional. It will also get the most use because it makes me happy. 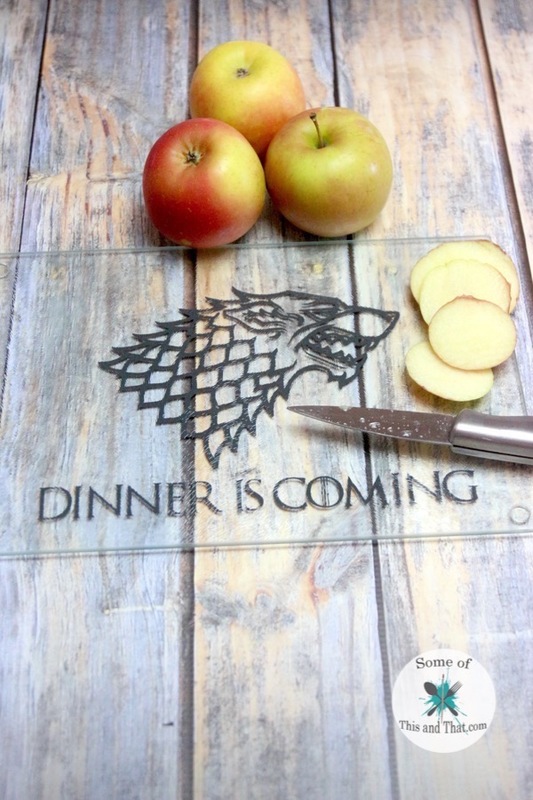 This DIY Game of Thrones Cutting board is perfect for the GOT fan! 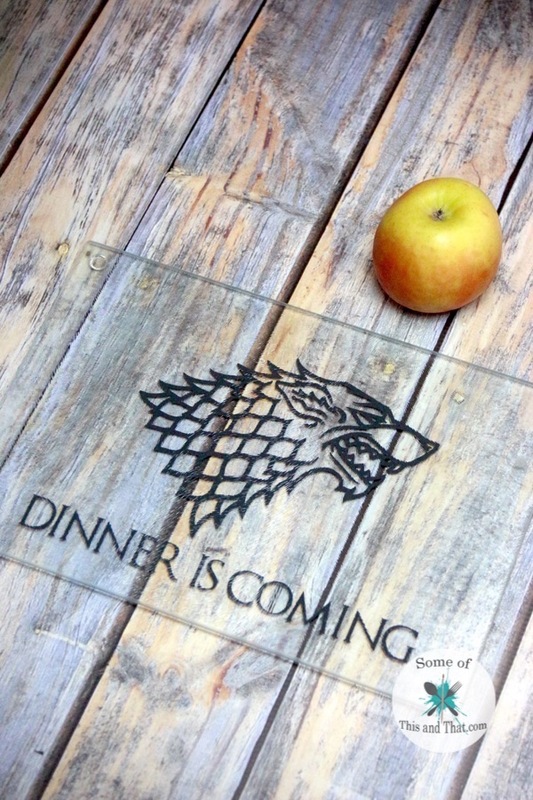 Instead of saying “Winter is Coming” I opted to make it more kitchen appropriate and have it say “Dinner is Coming”. I may make a few more for some friends, but for now, this one is mine! Since I do not have a license for the fonts or images used, I show you how to make this decal from scratch in the video below! The font used is called Game of Thrones and can be found at Fonts4Free.net. It is a free font that can be used for personal use. If you plan on making these to sell, you may want to look into purchasing a license for the font first. If you were to make your own cutting board, which theme would you do? Also, be sure to check out all of our other Nerdy Crafts here on the blog! Previous Post: « Customizable DIY Notepads!